We love the dry air and moderate temps of this area and as long as both the motor home and we are not moving, the elevation doesn’t bother us either. You won’t see us doing gymnastics up here though as just a little effort results in a lot of gasping. With this in mind, we plan our short trip south to our next destination. We want to stop at Mesa Verde National Park for a re-visit of this favorite place. Can’t tell you whether we enjoy the reverence of the cliff dwelling sites or the tastiness of the gourmet game at the Metate Room Restaurant, but we intend to sample both. So which way to go? Option one over the Million Dollar Highway (which is actually listed on dangerousroads.org) is the shortest route. Storm “believes” we can make it. Option two which I prefer takes us north first then over a low pass (6,000+ feet) taking it easy on the RV and on my nerves. 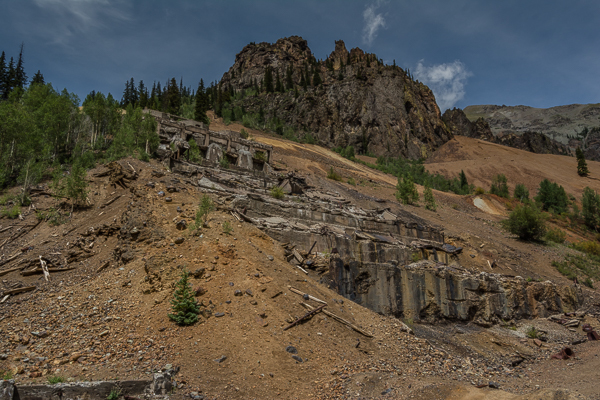 Although we have tried a couple times with members of the Dawson Gang in the past on motorcycles, we never made it all the way from Durango to Ouray on 550 due to horrible weather over the high passes along this route. Laps full of hail and brilliantly vivid lightning sent us scrambling for a turn around on each prior attempt. 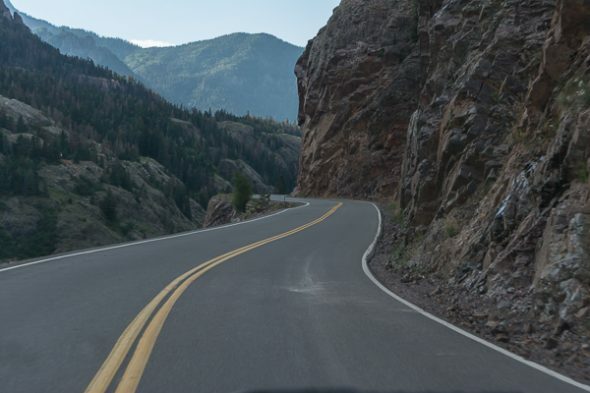 To help us decide whether to take this route or an alternate on which I might sight-see along the way (something I would not get to do while riding with my eyes clinched as tightly as my hand on the rail beside my seat in the RV along Hwy 550). View heading back north – in the RV going south I would be on the ledge with no guardrail and a million foot drop-off! I think you can see from the photo above that the lack of guardrails makes the ride (even in a car) a little thrilling for the passenger going south. Add to this the excitement of coaxing the RV over three extremely high passes (Coal Bank Pass -10,640 ft, Molas Pass -10,970 ft and Red Mountain Pass -11,018 ft) and I believe anyone would agree that the RV should pick another route. We arrive in Silverton awed by the views we have seen so far. Jim finds a Prius-able dirt road for us to follow out of Silverton leading to an abandoned ore mill at the Ghost Town of Eureka. Storm carefully explores the old mill while I play photographer, then it is off to lunch and some train admiring in Silverton. We finish 550 by driving to the Durango city limits and turning around – no time to explore there but at least we finally made it across the whole Million Dollar’s worth of highway. Charlie and I have ridden the Silverton/Durango train. Brings back memories! Loved the country and the sights. Stayed in Durango and witnessed a black bear pilfering a garbage can! In the middle of the night just below my bed! He wasn’t quiet about it! And a black bear broke into the ice cream social at the hotel. Folks did scatter. I don’t know who was more frightened—the bear or the folks! Wow – I am glad we did not have that kind of excitement on our ride!! Is is a beautiful train ride and like you, I highly recommend it to anyone who visits Silverton/Durango. Terrie and I finally rode 550 from Durango to Montrose three years ago on the bikes. It was a great ride. The year that the Dawsongang made it to Mesa Verde we rode 62 and 145 to 550 to Montrose. It was a great ride, you should enjoy it in the RV. If you do it later in the day, in the late afternoon you should see elk in the meadows of the Delores River bottoms as you get nearer Cortez. We enjoyed that ride in the Prius, but the steep grades and limited number of places to pull off and let the RV cool off if it needs it are going to send us in another direction when we leave with it. We can’t stand the thought of all those cars and trucks lined up behind us as we slowly claw our way up to the top of those 3 passes and then back down to save our brakes.